In response to requests for briefer and less expensive argument readers, Contemporary & Classic Arguments offers an ample selection of readings in a compact size for less than half the price of full size books. Contemporary & Classic Arguments is flexibly organized into two anthologies that model an extensive range of argumentative writing. 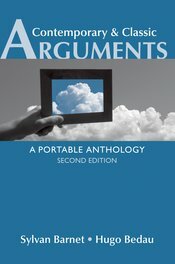 Adapted from the best-selling full-size argument text/reader Current Issues & Enduring Questions, it offers two brief chapters on analyzing and writing arguments, a provocative selection of contemporary arguments and casebooks to engage students with some of today’s most pressing topics, and a collection of classic essays that provide time-tested models of effective argument. Like other volumes in the Bedford/St. Martin’s popular series of Portable Anthologies and Portable Guides, Contemporary & Classic Arguments offers the series’ trademark combination of high quality and great value for teachers of writing and their cost-conscious students.